The Friends of the Flange : I've wanted to write this all my life. I've wanted to write this all my life. Today is October 21, 2015. I'm not holding a hoverboard and Jaws 19 isn't coming up on Ticketline, so I'm not holding my breath that Marty McFly is actually going to show up. I'm not going to pass up the change to have a little bit of fun with pop culture, though, so today's blog is going take a look Back to the Future III. I haven't actually been waiting my entire life--that title is a reference to Doc's quote when he gets to pull the whistle-- but since I don't have my own time machine, I won't ever get another chance to do this again. In the last part of the trilogy, Doc Brown and Marty end up trapped in 1885 after the Delorean breaks down. The time machine components will still work, though, if they can only find a way to get the car moving at 88 MPH. Eventually, they hatch a plan to steam a locomotive and push the Delorean up to speed. Marty goes back to 1985 but Doc chooses to stay at the last minute. When he arrives the Delorean is crushed by a freight train coming down the same tracks in the future; moments later, Doc and the family he has formed in the 1880s arrive in a flying, flux-capacitor equipped locomotive. Midland Spinners achieved speeds of around 90 MPH in general service. 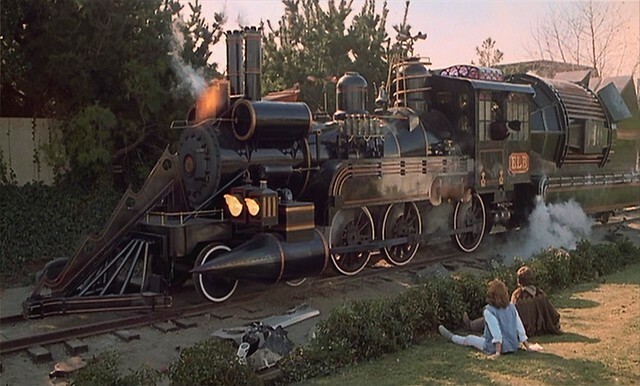 The locomotive that "played" the one in Back to the Future III was the Sierra Railroad 3, a frequent face in many large and small screen productions. During filming it was provided with an alternate smokestack, and the movie commissioned a model for the scene where the train wrecks. It is more or less local to the area where Doc and Marty would have traveled, but was built in 1891, six years after the movie was set. It is unlikely--but not impossible--that a steam locomotive of that era would have been capable of achieving a sped of 88MPH. Some British locomotives in the 1880s clocked in of speeds up to 90 MPH. However, these locomotives were of a very different design than the type used in the American hinterlands: Their high speeds were achieved with a single, oversized pair of drive wheels. Tracks in the American frontier were often of a poor quality, which forced train crews to operate at a lower speed than the engine was capable of. Doc's special fuel--which, from his dialogue seem to be three logs of solid anthracite-- are more problematic. Steam locomotives are specifically designed to burn one fuel over another, and usually don't burn a fuel they aren't designed to use with any efficiency. The train in the movie burns wood*, but the Wooten firebox, specifically used for anthracite burning, wasn't even invented until 1877. Furthermore, pure anthracite requires quite a bit of care to ignite in the first place--far more than just throwing a chunk of it into a fire. Do you even know how much locomotives eat, Doc? More than this. Of course, I'm probably lowballing Doc Brown's ability to make chemistry work for him. He engineered a time machine and a personal fusion device, getting some coal to catch on fire is probably no more of a challenge than brewing coffee. 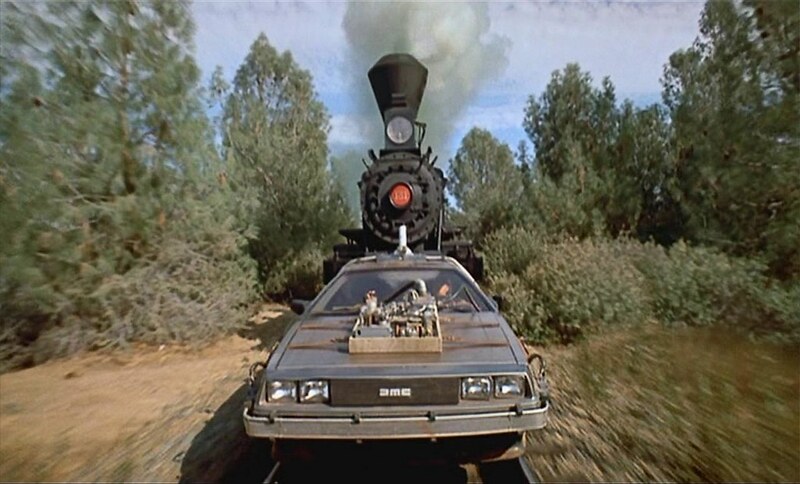 Throughout the process of the train robbery--excuse me, science experiment-- Doc Brown warns Marty to hurry up and get to the future, or the locomotive might explode. It's unclear whether the producers are missing the rather esoteric difference between a boiler explosion and a crown sheet failure. In reality, boiler explosions were actually very rare, as the safety valves exist specifically to prevent such a disaster. However, because of the way the locomotive slowly comes apart during the scene and because Doc appears familiar enough with the locomotive's controls to keep it moving and in water, we'll assume that he really did have a boiler failure in mind. Both Toy Story 3 and The Lone Ranger allude to this now-iconic scene. Marty arrives arrives back in 1985 to a future that has undergone some minor changes, one of them possibly being that Operation Lifesaver campaigns do not exist. He seems ready to move on and settle down with Jennifer, then Doc Brown appears with another wibbly wobbly....thing. First--plotwise--how did Doc Brown get his hands on another locomotive? Presumably the authorities are on to his tendency to abscond with them. Once he actually gets one, how did he access the materials retrofit one into a time machine, when the entire plot of the third movie kicked off with him being unable to access the materials to fix the Delorean in 1885? How did he physically manage to retrofit that locomotive by himself, without sending future Marty a telegraph that says "Bring me a forklift?" And since he did succeed somehow, how is the timeline not drastically altered by all the bling he put on this behemoth? Finally, how does Whyte notation address that flying aspect? The easiest explanation is the typical one: Hollywood has taken a significant, painful amount of artistic license. But that again sells Doc Brown's intelligence short. I'll posit instead that the locomotive is actually powered by a larger-scaled Mr. Fusion and has a closed water supply system. The conspicuous placement of condensing tubes on what I would assume to be a turbine and generator instead of a conventional tender are more evidence of this. There were actually a few prototypical locomotives that functioned like this, minus the nuclear power aspect, so it isn't outside the realm of possibility. If you think about it, this actually makes sense with the plot. Doc probably wouldn't want to chance another situation where he'd become trapped in a different time period because he was unable to access fuel or spare parts. A condensing engine works because he almost never has to worry about replenishing the engine, and since he's really only hauling his family around, he doesn't need to worry about the reduced power that made this sort of engine challenging in real life. The headlights and smokestacks are also redundant, as if Doc has the possibility of a breakdown in some godforsaken Cretaceous boondock right in the forefront of his mind. The six whistles, though, that's just for show. 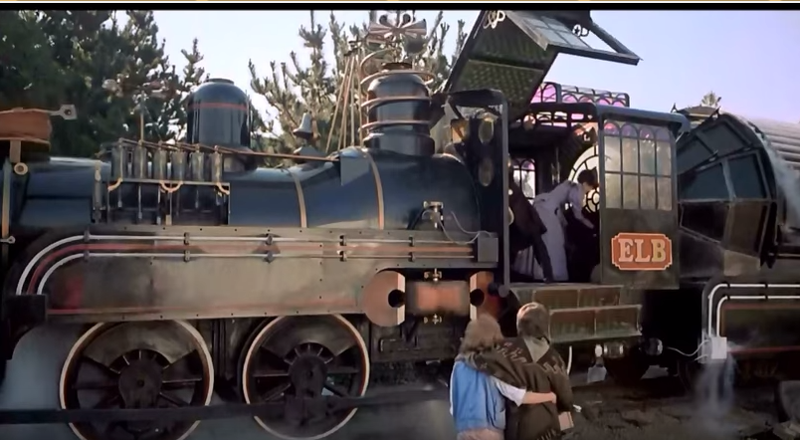 If you're going to build a time traveling train, might as well do it in style. *In real life, the Sierra 3 burns oil, but it has been made to appear as a wood burner in the film.